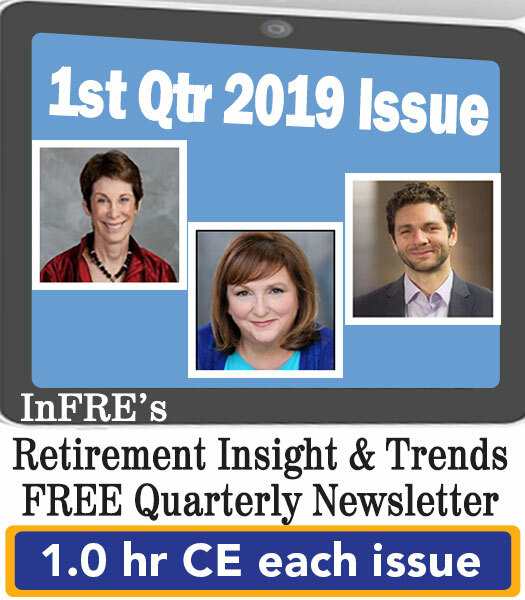 You can earn 1 CRC®, CFP®, ASPPA, and the American College’s Professional Recertification Program (CLU®, ChFC®, CASL) CE credit for the March, 2019 issue of Retirement InSight and Trends. Click here to access the quiz and earn 1 free CE credit upon successful completion of the quiz. When you have completed the last question, click the “submit” button to submit your final answers. You may not return to review or change your answers after clicking submit or if you close the browser window. You may restart the quiz if needed. A score of 70% is required to pass the quiz and earn CE credit. You will see your score on your screen upon submitting your answers. An email will automatically be sent to you for your records as proof of successful completion. Click here for additional CE opportunities through InFRE’s CE partner, the Int’l Retirement Resource Center.